Editor's note: To expand the capabilities of gene expression regulation, it is imperative to directly control the activation of transcription in vivo. 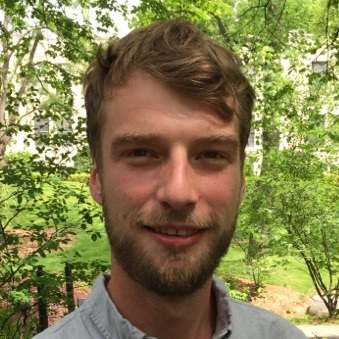 Dr. James Chappell and Dr. Julius Lucks shared with Benchling how they discovered Small Transcription Activating RNAs (STARs) and how you can use the STAR system in your own lab to control transcription. In this year's iGEM competition, the Imperial College of London used the STAR system to control populations in a co-culture. They won the Grand Prize for the project, and the STAR system they used won Best New Basic Part! Congratulations to the Imperial College of London team, and stay tuned for more applications of the STAR system. RNA polymerase (RNAP) synthesizes the messenger RNA of every single gene expressed in the cell. As such, controlling RNAP is at the heart of controlling, or programming, gene expression. However, this task is not easy - RNAP is highly specialized and able to form incredibly stable, yet dynamic, interactions with DNA that allow it to synthesize upwards of 100 nucleotides of RNA per second . While synthetic biologists have developed a suite of tools to start RNAP, the challenge is to stop this highly processive enzyme in its tracks and terminate transcription. One of the two major strategies bacterial cells use for this depends entirely on a remarkable, albeit small, RNA structure called an RNA transcriptional terminator (Figure 1). Figure 1. Transcriptional terminators are composed of a short RNA hairpin followed by a poly uracil sequence. As RNA polymerase (RNAP) transcribes these terminators, it pauses during the transcription of the poly uracil sequence. This pausing allows time for the nascent RNA to fold into the hairpin, which results in dissociation of RNAP from its DNA template and termination of transcription. Transcriptional terminators are typically found at the end of genes in bacteria to signal the end of transcribing messenger RNAs. Typically, these terminators occur at the end of genes to signal the end of the messenger RNA. However, there are some terminators that are present in front of genes called attenuators [2,3]. Rather than simply stop transcription before it gets going, these attenuators actually act as genetic switches that only allow transcription under specific cellular conditions. Upstream RNA sequences and ligand interactions can interfere with the formation of the terminator hairpin, allowing it to form in some cases and not to form in others. We recently harnessed this concept to create an entirely new type of RNA-based regulation – small RNA transcriptional activation. Inspired by the regulatory power of such a simple RNA structure, we recently described an approach to convert transcriptional terminators into activators of gene expression called Small Transcription Activating RNAs (STARs) (Figure 2). 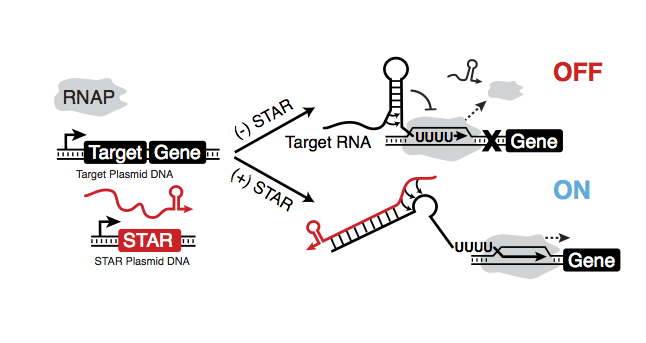 The STAR system consists of two components – a target RNA containing a transcriptional terminator hairpin placed in front of a gene to be regulated, and a separately expressed STAR RNA. Figure 2. Small Transcription Activating RNAs (STARs) function by disrupting a transcriptional terminator within a target RNA placed before a gene of interest. Alone, the terminator prevents transcription of the downstream gene (OFF). STARs are designed to bind to the 5’ side of the terminator hairpin sequence to prevent it’s folding and allow transcription (ON). By itself, RNAP transcribes the target RNA, allowing it to terminate transcription before the downstream gene is reached, effectively turning that gene OFF. To activate this gene, the trans-acting STAR is produced, which is designed to bind to the 5’ half of the terminator hairpin. When present, the STAR prevents terminator folding and allows the RNAP to transcribe the downstream gene, turning that gene ON. The simplistic nature of this switch – composed of only a target RNA and a complementary STAR – makes it one of the most compact regulatory systems to date. We have also shown that STARs can be used within a variety of contexts including controlling expression of individual genes and creating RNA-based genetic logic gates . How Do You Enable STARs Power in Your Research? To use the STAR system to control a gene of interest (GOI), simply place your GOI via standard cloning procedures into the ‘Target Plasmid’ (Figure 3a). The Target Plasmid is a mid-copy plasmid (p15A origin) composed of a constitutive promoter, target RNA and GOI, that when transformed into E. coli will turn expression of your GOI OFF. To turn expression of your GOI ON, transform into the same cells a second plasmid called the ‘STAR Plasmid’, which constitutively expresses the complementary STAR. We have described 4 STAR systems based on unique target RNA/STAR sequences that have distinct regulatory characteristics including OFF/ON levels and fold of activation  (Figure 3b) (see table below). For example, if a low OFF state and high-fold activation is required, we recommend the AD1 STAR system that shows up to ~94-fold activation with very low expression in the OFF state. In addition, for each of these STAR systems we have created a series of ‘length variants’, that provide further functional diversity  and have more recently shown that promoter strength libraries can be used to tune STAR expression and fold of activation . If you need to regulate multiple genes within the same cell, we recommend using the four STAR systems we have shown to act orthogonally (Figure 3c). In addition, these STARs are also orthogonal to a previously published library of small RNA (sRNA) transcriptional repressors [3,6], to achieve independent activation and repression of gene expression (Figure 3c). Finally, STARs can be used to create RNA-based genetic logic gates to control expression of your GOI based on conditional presence of multiple inputs  (Figure 3d). For example, RNA-based A AND B logic gates can be created by transcriptionally fusing two STAR target RNAs in front of your GOI so that only in the presence of the two corresponding STARs will your GOI be expressed. Likewise you can create NIMPLY (A AND NOT B) logic gates, by fusing target RNAs from activators and repressors, so that your GOI is made when only the STAR is present and under no other condition. Table 1. All the plasmids can be ordered from Addgene and their maps can be downloaded from Benchling. For a full explanation of STARs, please see our full manuscript on Nature Chemical Biology. 1. Ray-Soni, A., Bellecourt, M.J. & Landick, R. Mechanisms of Bacterial Transcription Termination: All Good Things Must End. Annu Rev Biochem 85, 319-347 (2016). 2. Brantl, S. & Wagner, E.G. Antisense RNA-mediated transcriptional attenuation: an in vitro study of plasmid pT181. Molecular microbiology 35, 1469-1482 (2000). 3. Takahashi, M.K. & Lucks, J.B. A modular strategy for engineering orthogonal chimeric RNA transcription regulators. Nucleic acids research 41, 7577-7588 (2013). 4. Chappell, J., Takahashi, M.K. & Lucks, J.B. 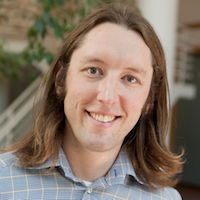 Creating small transcription activating RNAs. Nature chemical biology 11, 214-220 (2015). 5. Meyer, S., Chappell, J., Sankar, S., Chew, R. & Lucks, J.B. Improving fold activation of small transcription activating RNAs (STARs) with rational RNA engineering strategies. Biotechnology and bioengineering 113, 216-225 (2016). 6. Lucks, J.B., Qi, L., Mutalik, V.K., Wang, D. & Arkin, A.P. Versatile RNA-sensing transcriptional regulators for engineering genetic networks. Proceedings of the National Academy of Sciences of the United States of America 108, 8617-8622 (2011).